Hobie Forums • View topic - Jib Sheet in Front Crossbar - Diagram! Jib Sheet in Front Crossbar - Diagram! Post subject: Jib Sheet in Front Crossbar - Diagram! My Tiger (bought used) has the jib sheets flopping around on the tramp and I'd like to move the ends into the front crossbar as I saw in the instructions. Anyone know how long that piece of 1/4" shock cord is supposed to be that joins the ends together inside the crossbar? I know it has to be shorter than the length of the crossbar, but how short? Last edited by poolemarkw on Wed Aug 13, 2014 4:38 pm, edited 1 time in total. Ok, so I moved my jib sheet ends inside the front crossbar and connected them to about a 5' long piece of 1/4" shock cord. I put 2" long loops in the ends of the shock cord using hog rings and then tied the ends of the jib sheet to each using a single knot. The problem is that the knots get stuck on ridges of the braces inside the crossbar until I pull hard enough or shake it enough to pop free. 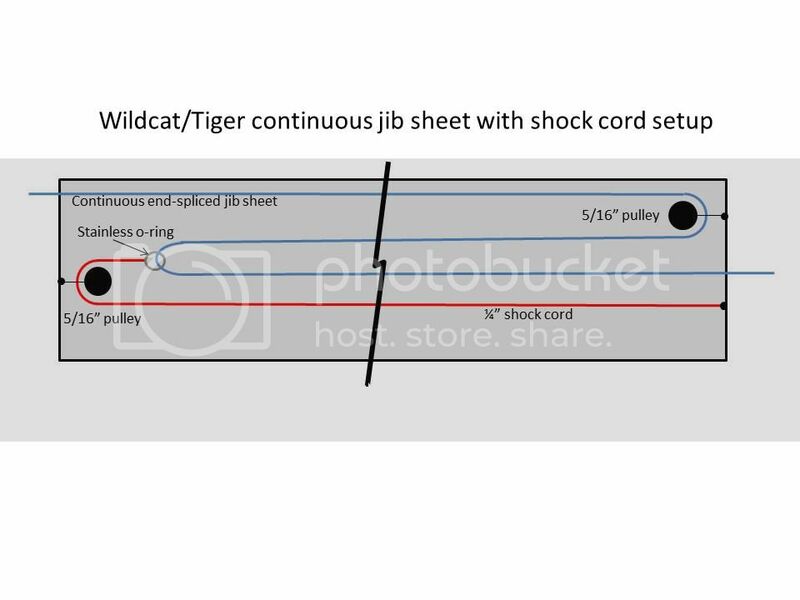 Is there a better way to attach the ends of the jib sheet to the ends of the shock cord so that it moves freely? There are three small turning blocks inside the front crossbar that the shock cord travels on to take up the jib sheet slack. The jib sheet should be continuous (ends spliced together) so that it runs without binding. Ok, I'm really confused now! I opened the ends of the crossbar and there weren't any small blocks inside. You wouldn't happen to have a diagram, would you? On my boat the jib sheet is run thru the front crossbar w/o any bungy. Only an end for end splice. I never thought of a bungy inside to take up some of the slack. That would clean up the tramp some. My trusty Hobie Tiger is for sale! Yup, time to step up! I ain't gettin any younger. And 2 yrs was enough intro and training for me and my crew. Ok, here you go! Here's a diagram showing how it's set up on the Wildcat and Tiger. And here's a link to a good youtube video showing how to do the end-splice. Post subject: Re: Jib Sheet in Front Crossbar - Diagram! I installed the jib sheeting in the front crossbar and it works great! the jib sheet doesn't get caught in the spin blocks anymore and the length is OK to pull (hence the bungy) out of the crossbar while on the wire. I used 35' of XLS and did an end to end splice so it's continuous! Now for a change to keep the Cunningham out of the spin blocks. Will look around at what others have done, don't want to reinvent the wheel. Plus still looking to build the fleet and get a buyer here locally for the Tiger.